The future of the pistol caliber carbine! Gen II: Back and Better than Ever. The Gen II refined many of the performance factors of the Gen I. Chief among them, better ergonomics thanks to a redesigned trigger, short throw safety lever, and more comfortable pistol grip. Other upgrades include a chrome-lined barrel, beefed-up barrel contour, improved fire control group, and a re-positioned fire / safe switch, among others. The Vector CRB is the non-NFA, semi-automatic, carbine variant with a 16" barrel. The Defiance stock provides a wide range of adjustment and length of pull. Flip sights, full length picatinny top rail, lower picatinny accessory rail, and a Glock magazine all come standard. 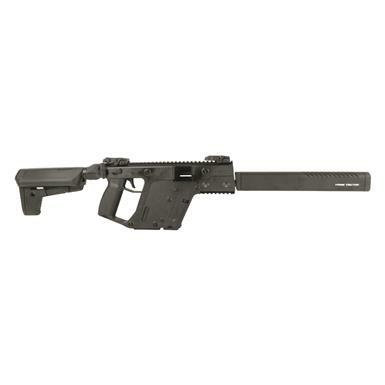 Kriss Vector Gen II CRB, Semi-automatic, .45 ACP, 16 Barrel, 13+1 Rounds, 13+1 is rated 5.0 out of 5 by 2. Rated 5 out of 5 by Ddoutdoorsman from Excellent Gun for the money. I have never had a problem with this Gun Reliable and fun Gun to shoot. Never had a problem with it. Rated 5 out of 5 by Drew75 from Excellent!! I first fired a Kriss Vector when shooting with some friends and vowed to own one. Seeing this one being available with 4-pay, I was like "Are you kidding?! "The designers of this firearm knew what they were doing. Most of the recoil from the projectile is directed downward and, as a result, you feel very, VERY little kick, allowing for repeated firing with little adjustment required from barrel rise. The Kriss Vector is as smooth firing of a weapon as you could ever dream of owning. Whether you want something for plinking or home defense, do yourself a favor and buy this gun!! APF 6.5 DMR AR-15, Semi-Automatic, 6.5mm Grendel, 16"
The world's only NO-LUBE Rifle. Match-grade accuracy in the formidable 6.5mm Grendel.